THE ADVERTISEMENTS ON THIS WEB SITE ARE NOT ENDORSED BY GEOR-JAN GERMAN SHEPHERD DOGS. For 30 years, showing and breeding German Shepherd Dogs has been our family's passion. 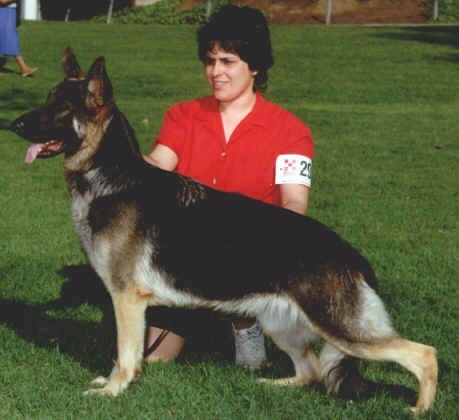 Our first introduction into the show world was through obedience and conformation with Smoketree's Altara C.D.X. We moved primarily into conformation with the first litter we bred producing our first champion, Geor-Jan's Countess. Breeding no more than one to two litters a year, our dogs have produced two ROMs and eleven champions: Five of them owner/handled to their championships. Our Goal is to strive for excellence: Breeding dogs with brains, beauty and structure that exemplify the AKC standard. Click on a Bone to see our dogs. Thank you for sharing our past, present and future.